therese: Why the September Issue is so important. Why the September Issue is so important. 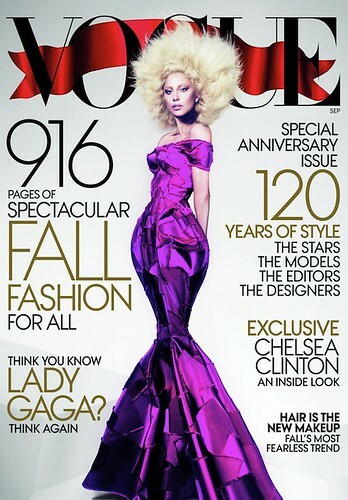 This year's September issue of US Vogue is their biggest yet at 916 pages. Which is great for them, because it means they got lots of advertising revenue this month, and will keep their position of influence at the top of the fashion pyramid (at this stage, the majority of bloggers feature somewhere down the bottom) for a little bit longer. In magazine publishing, the September issue is the most important, with the most lavish fashion shoots and the most ads. This idea was cemented in popular culture with the release of the documentary The September Issue, which looks at the process of putting together (what was at the time) Vogue's biggest ever issue. But what is it about September that makes it so special? Why not spread out some of that creativity and advertising dollars throughout the rest of the year? I came across this quote while reading Fashioning Teenagers: A Cultural History of Seventeen Magazine by Kelly Massoni. It's a great read for those interested in magazine publishing in the 20th century, how a magazine works and the rise of the female voice in the media. "We hope most of you had fun with our 'summer fun' issue. Perhaps we should explain how the fashion business works. The July issue of any magazine is low in fashion pages, simply because there are very few clothes made to sell in July. The manufacturers are busy working on their fall lines; stores push 'sale' merchandise in July. But, as you can see from our August and September issues, we've rounded up big back-to-school fashion wardrobes for you." - Helen Valentine's Editor's Letter in the August 1950 issue of Seventeen. So the September issue is important because it signals a fresh start with the school and university year starting in September in the US. The idea of having the major sales over summer and releasing the big collections in autumn seems totally outdated now, what with sales happening year-round post-recession and labels releasing up to eight different collections a year. But the publishing industry, like the music industry, is pretty set in its old ways and is often slow to adjust with the changing marketplace. On a semi-related note, this article, published in the New York Times is an interesting look at the sharp decline in readership numbers and how magazines are trying to win them back. I hope you've got a NYT subscription, it's totally worth it!